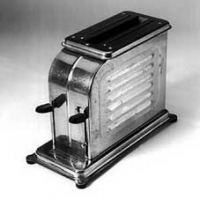 This was the first consumer pop-up toaster, called the Toastmaster. It was introduced in 1926 by Waters-Genter Company, formed in 1921 to produce the invention patented by Charles Strite in 1919. The first Model 1-A-1 was designed by factory superintendent Murray Ireland. Since it automatically turned off the toaster when toast was done, and toasted both sided of the bread simultaneously, it revolutionized the time-consuming chores of watching the toast, and turning it when one side was done. The company was acquired later in the year by McGraw Electric Company, later to be known a McGraw-Edison, and later still as Toastmaster (see below). General Electric introduced its first widely-distributed electric toaster in 1908 to an already full line of consumer heating and cooking devices being marketed. The two-slice model D-12, with a porcelain base, remained in production until 1913. Toasters were first tested by Underwriter's Laboratories in 1909 and included models by Westinghouse and General Electric. At that time, toasters were of completely open construction, with no cover or shell, and were viewed as fire hazards. Later toasters became much safer with manually-operated drop-down side doors, which not only kept hands away from the red-hot heating elements, but nicely flipped over the bread to expose the opposite side to the heat, when doors were opened. Still, they took careful watching to avoid burnt toast. In 1939, the Toastmaster model 1B9, designed by Jean Otis Reinecke and his staff at Barnes & Reinecke, was introduced by McGraw Electric Company. It was the first to exploit the curvature of chrome-plated shells on toasters, increased sales dramatically, was widely imitated, and served as the typeform for toasters well into the 1960s. One of Reinecke's designers, Fred Priess, designed the linear "three loop" decoration which became the company's symbol. The 1947 IB14 model sold seven million units by 1961. In 1980, the company changed its company name to Toastmaster. Jean Otis Reinecke (1909-1987) was a US industrial designer born in Kansas. He started his own sign painter shop at age 17. He began a career in commercial art in St. Louis and in 1933 began working on the Chicago Century of Progress for the General Display Company. In 1935 he established Barnes and Reinecke in partnership with James Barnes, which by 1948 had a staff of 375. He designed the 1947 Toastmaster (see above) and is famous for the design of Hamilton Beach drink mixers (1939) and Scotch tape dispensers (1940, 1941). In 1940 he was featured in an article, Today's Young Men, as one who achieved notable success while still in their twenties and thirties. In 1948 he sold his interest in the firm to Barnes and established J.O. Reinecke & Associates with offices in Chicago, IL , and in 1958, also in Pasadena, CA., the latter of which he maintained after 1974. He was president of SID (a predecessor of IDSA) in 1952. Toasters continue to win design awards. In 1990, the winner of a Black & Decker Toast of the Future design competition was John Cupit, of Cleveland, OH for his see-through toaster, which allowed visibility of bread toasting. And a toaster designed by Michael Graves for Target discount stores won a gold IDEA award in 1999.